What incredibly important profession combines horrible hours, bad pay, and a poor lifestyle? Truck driving. This is a job that destroys so many lives that it could soon become unsustainable. Here's why. Truck drivers are expected to drive up to fourteen hours straight a day, receiving roughly ten hours off prior to the beginning of the next shift. Legislation regulating the amount of driving a trucker performs over the course of a day and week does exist, but these rules are commonly bent and broken. Truckers rarely receive more than one day of work off a week. The chance of dying on the job is extremely high, with deaths of truckers in auto accidents accounting for 12% of all work related deaths in the United States. All this comes with a paltry average annual salary of just under $38,000. A trucker can easily work 4400 hours a year, coming to an hourly wage of $8.70. In addition to long hours, drivers rarely eat three hot meals a day. Many truckers live off of prepackaged, high calorie snacks during the day. When truckers do stop for the night, they often eat a large, unhealthy meal before settling into bed. The hours spent sitting in a truck cab along with poor food choices lead to a disproportionally obese workforce. Only 14% of the 3 million truck drivers in the United States are not overweight or obese. Of these 3 million truck drivers, only 8% exercise regularly compared to 49% of the general population. The hours worked by truck drivers make it nearly impossible to make or keep medical appointments. This limits their options when a health problem arises, leading many truck drivers to ignore symptoms. As of 1970, laws have existed to prevent those with insulin-treated diabetes mellitus from legally becoming truck drivers. This is quite the paradox, as the lifestyle and diets available to truckers open them up to an increased risk of diabetes. Exemptions now exist allowing some using insulin to drive, but it is yet another hurdler for truckers to cross. Depression is also a very real problem for truck drivers due to the amount of time spent away from home, lack of work-related relationships, and general loneliness. These health related issues are just part of the reason for the phenomenal rate of turnover within the profession - over 100% . This turnover rate amongst professional truck drivers has led a large number of veterans returning from Iraq and Afghanistan to take up the profession. Many of these new drivers are fearful of a the complication of post-traumatic stress disorder with the already stressful, but dramatically different life of a trucker. While big rigs have sleeping quarters in them, truck drivers still need to find a place to park at the end of each day. States are continually shutting down designated trucker rest stops along interstates to cut costs, leaving truckers to park along interstates or in empty parking lots to get a night's rest. Long haul truckers often fight for position at truck stops, seeking a place to sleep in safety. The National Transportation Safety Board estimates that 167,000 of 185,000 open spots at truck stops are filled on a nightly basis. This leaves close to twenty-thousand spots, but the spot a driver needs at night might be dozens of miles off route, creating a problem when he or she resumes driving the next day. 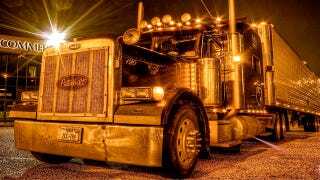 Becoming a professional truck driver combines low pay, a lifestyle that leads to poor health, and continual stress stemming from making stops and finding a place to sleep at night. Is it a desirable job? Maybe to some. Is the job necessary to sustain modern lifestyles? Absolutely. Let's hope we can alleviate these health and lifestyle problems before this necessary part of our service-based society erodes away. Additional images from Robert Couse-Baker/Flick and Terren/Flickr. Sources linked within the article.